Dressing modestly in the summer heat can feel oppressive and uncomfortable. My fellow New Yorkers know how humid it gets here! 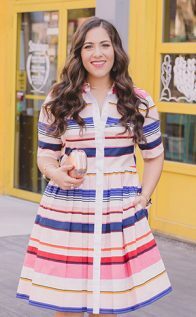 Over the years I’ve been asked how I handle dressing modestly throughout the summer and the truth is that when it’s 90 degrees, a three quarter sleeve dress verses a sleeveless dress just doesn’t make that much of a difference. I mean, you’ll be extremely hot regardless! But there are definitely ways you can dress that can make the summer heat feel more bearable. This is probably a no-brainer to most, but the right fabrics will go a long way in keeping you cool and comfortable. 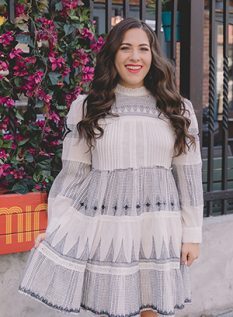 I have a long sleeve, high neck dress that feels completely fine to wear in the summer because of how lightweight, breathable, and breezy the fabric is. Fabrics like cotton, rayon, linen, silk, and jersey are great, and, of course, I’d avoid fabrics like polyester and wool. Obviously, clothes that are more fitted will cling to your skin and probably make you feel sticky and uncomfortable in the humidity and heat. Opt for looser silhouettes on those warmer days and definitely avoid the urge to layer when possible. 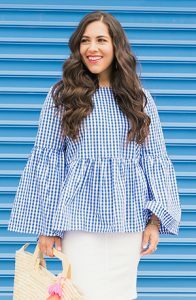 A lot of people wear shells under short sleeve tops or dresses to stay modest, but I prefer finding tops with sleeves that cover the elbow and have a neckline that I’m comfortable with to begin with. A fitted shell means more fabric and that means more of a chance of being hot. If you’re worried about your frame being swallowed by looser silhouettes, you can streamline your look and keep it more proportionate by pairing a looser, breezy top with a fitted, stretchy pencil skirt. You can also choose a fit and flare dress that cinches you in at the waist. Dresses are my best friend year round but even more so when it comes to summertime. Throw on a breezy, lightweight dress and you’re set! 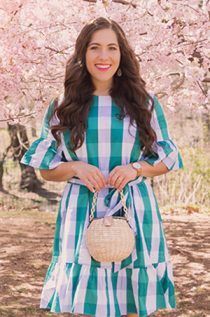 You don’t have to worry about anything clinging to your waist or sticking to your skin, especially if you opt for an easy swing dress or shift style. Dresses are my outfit of choice all summer long.